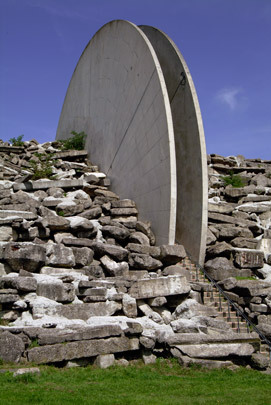 Frans de Wit, the artist charged with designing this recreational combination of rock-climbing facility and look-out point, went on to produce a fine example of landscape art. The climbing wall consists of irregularly stacked concrete blocks, casts made of actual mountaineering rocks in the Ardennes. The look-out point is reached up an artificial hill forming part of a training circuit. Narrow steps wedged between two gigantic concrete discs 26 metres in diameter provide an alternative way up. This vertical thrust offsets the horizontal trails of rubble across the hill.